Better late than never! Here are the pictures from our seminar in June 2017 with Pat Hendricks shihan. Practicing aikido for self defense is like exercising to lose weight: for all its benefits, the last is the reason you started in the first place. 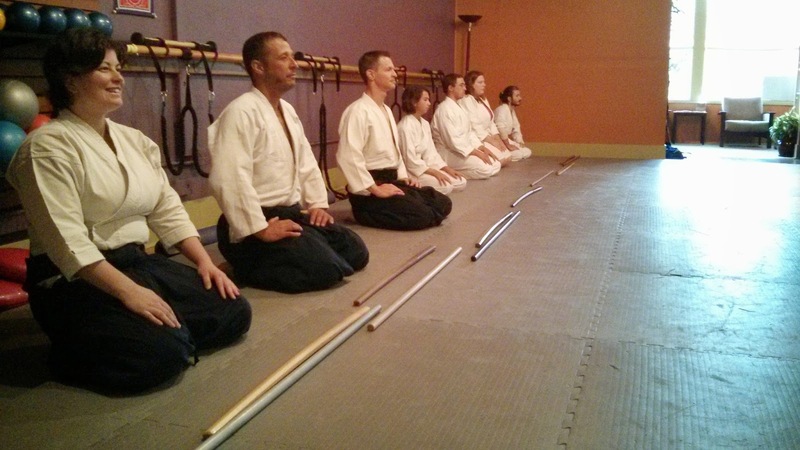 It's not just aikido. Without stress-testing in real-world scenarios, many, if not most martial arts fall into the trap of narrowing their focus to a specific set of techniques for a specific set of attacks. The Real World is random, chaotic, and dangerous. The dojo is safe and controlled with a set of rules to follow. As a result, those of us who practice martial arts in the dojo might find ourselves ill-equipped to handle situations outside. This raises the inevitable question: why even bother with martial arts? Short answer, in regards to self-defense: it won't hurt, and it'll probably help, but not how you think. Martial arts train us to be aware of our bodies and surroundings. We don't see people and environments the same as non-practitioners. There is a raised sense of space, and intuition you don't get from any other hobby or training. Martial artists hold themselves differently: a little more relaxed, grounded, and when something does go sideways, we're more equipped to deal with it. Over time, practicing a martial art also provides a level of confidence. We learn to walk a little taller and with intent, avoiding looking like a victim or easy prey to a would-be attacker. All martial arts work well within their contexts. Aikido is good for escaping standing grabs or holds by one or more attackers, and some weapon strikes. It fails in groundwork and defending against quick jabs and close quarters striking. So why not take BJJ (Brazillian Jiu Jitsu)? If I had time I would love to! But even BJJ has its strengths and weaknesses: it's virtually unstoppable on the ground against one attacker, but won't help much if the attacker has a buddy (or several), or refuses to go to the ground (see the last two Ronda Rousey fights where her opponents successfully avoided going to the mat where Ronda was strongest). Boxing is excellent for striking (and dodging, very important!) but weak in other areas. The list goes on, but I'll bring up one more example: MMA (mixed martial arts) might be the most well rounded as it addresses the three main areas of unarmed combat: striking, standing grappling, and mat work. Criticisms of MMA might include, "focusing on one area is better than trying to cover everything," or that there is too much emphasis on competition. Either way, being well rounded is not a bad thing when it comes to self defense and preparing yourself for a variety of encounters. I recommend anyone (myself included) who has only practiced one specialized martial art to get out there and try something else. Break out of your comfort zone and be a beginner again. If what you try isn't for you then move on and try something else. Find what works for you and devote yourself to achieve mastery, but don't be afraid to look outside your style and see what else is there. Side note, but related: If you want to learn more on the topic of violence and self-defense, Sam Harris recently had Gavin de Becker on his Waking up Podcast. They discussed a wide range of topics on violence and how to best prepare and protect yourself. Gavin recommended IMPACT training for straight up self-defense. Kinjo Dojo will be hosting Pat Hendricks Shihan in CO, June 10-11, 2017. The video has been posted for Charles-sensei's san-dan test from Aikido of San Leandro on youtube so go check it out! Also testing: Victor (3rd dan), Lana (3rd dan), and John (4th dan demo).